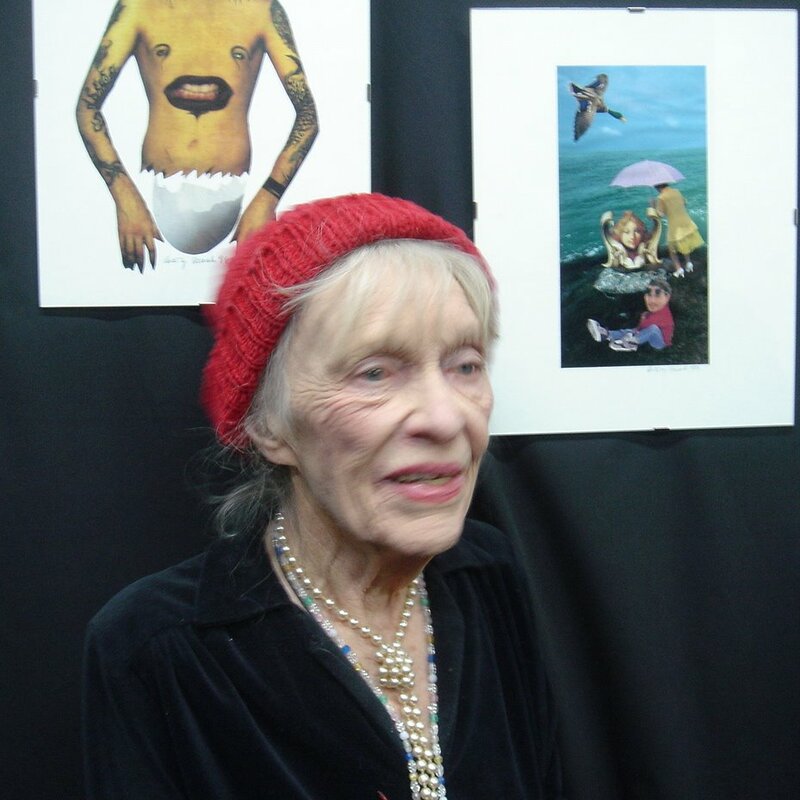 MB at Clayton Gallery & Outlaw Museum, New York City, 20 January 2005, for the opening of the “Four Octagenarians Show” who also included Taylor Mead, Herbert Huncke & Boris Lurie. 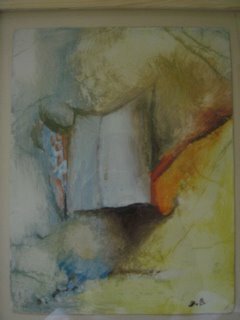 Mary Beach, painter, translator, editor, writer passed away last night in Cooperstown, NY. 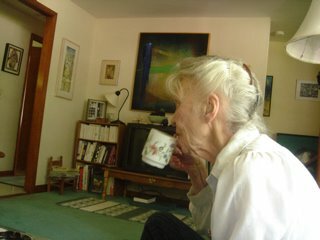 She would have been 87 on 11 April; her husband, the poet & collagist Claude Pélieu died on Christmas eve 2002. She was born in Hartford, Connecticut in 1919. In 1925, after her mother’s divorce, she moved to France. During the first part of World War II she lived in the small town of St. Jean de Luz, but, with the entrance of the United States in the war in 1941, she was soon viewed as a suspicious alien and was, for a time, interned in a Nazi prison camp. Despite her parents protests (but perhaps under the influence of her relative Sylvia Beach – famed proprietor of Paris’s Shakespeare & Co. and the first publisher of James Joyce), Mary pursued her life as an artist with great passion and from an early age. 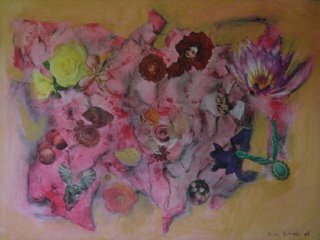 Her first solo show was at the Galerie du Béarn, in Pau, France in 1943, and she has since then continuously exhibited her work all over the world. Mary returned to the United States in 1946, where she married Alain Beach (the American war hero she had met in France) and had two children. She attended the Hartford Art School (where she won first prize in her class), and also attended school at the Museum of Fine Arts in Boston. In 1957 Mary and her family returned to France, to Strasbourg, and then Paris in 1959. She attended the esteemed Grande Chaumiere, where she studied under Henri Goetz. She exhibited at the historic Salon des Indépentes in Paris in both 1957 and 1958; won the Prix du Dôme at the Salon des Femmes Peintres in 1959; won 1st Prize, Vichy, France, Silver Medal in 1959 as well; and was exhibited at the Salon des Indépendents in Paris in 1960. After her husband’s death, she stayed on in France and met the painter & poet Claude Pélieu in 1962. A few years later they moved to San Francisco on Lawrence Ferlinghetti’s urging where they became an integral part of the Beat scene and started their four-handed translations into French of the work of several of the major Beat figures, including Bob Kaufman, Allen Ginsberg, William Burroughs and Ed Sanders. Mary Beach simulatenously started her publishing venture, “Beach Books, Texts and Documents,” which brought out a range of books and pamphlets by those and other writers. The late sixties saw Mary & Claude take up residency at the Chelsea Hotel in New York; in the early seventies they moved to England, first to London and then to the Sussex countryside. By the eighties they were back in the USA, first in Florida and then upstate New York in Cooperstown and, later lived in Norwich. After Claude’s death in 2002, Mary moved to Cherry Valley to be closer to her daughter Pam, who is married to the poet Charlie Plymell. Except for the sixties & early seventies when she was busy experimenting with cut-up writing (collected in Electric Banana — front & back cover reproduced below), publishing & (with Claude Pelieu) translating Burroughs, Ginsberg & alii into French while translating Pélieu into English, Mary Beach worked as a challenging & innovative painter whose oeuvre ranges from large figurative canvases (among others, a gorgeous series of portraits of contemporary poets such as Ginsberg, Burroughs, Ted Berrigan and Harry Smith) to various experiments with prints & etchings. During the late eighties she created what I think of as her major work: a sequence of very large abstract paintings based on photographs of the earth taken by the Landsat satellites. For me, the breathtaking beauty of these works resides in the tension resulting from the change in distances: bringing down to earth, re-creating at arm’s length — which is where the painter’s work happens — these cosmo-technological “visions” shot from the cold empty space miles above the planet. What this act of appropriation & détournement does is more than simply “humanize” the distances involved; in fact it flips the topographical map of the earth’s surface shot from outer-space completely over into another space: an inner-space where we can read the transformed landscapes as topographical mappings of our psychic landscapes. “Cosmo-nauts of inner space,” was what William Burroughs wanted the contemporary artist to become — & Mary Beach succeeds marvelously at doing, at painting, just that. 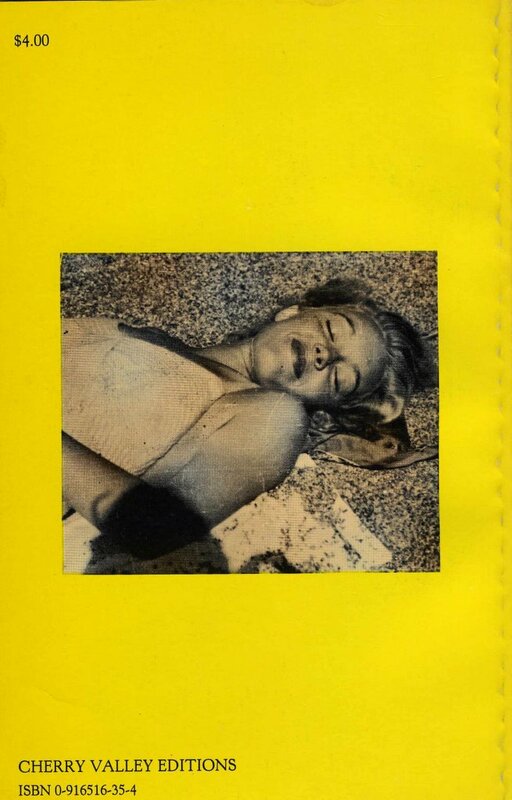 Simultaneously she kept creating serial collage-works (near daily visual diaries) that drew on the great French surrealist tradition as much as on the pop-art Warholian sixties. Some of her most powerful works are collaborations with Claude Pélieu in which layers of collage interact with layers of paint. Allen Ginsberg thought that her “abstract landscapes behind Claude Pélieu’s Burroughsian collages superimposed a ghostly nostalgic pop mind’s eye visionary world on the viewer’s quotidian glimpse of the planet.” Allen also told me that for him those works were the greatest examples of what true collaborations at all levels — mental, physical, spiritial — could and should be. The first thing she did when I visited her last — barely a month ago — was to drag out all the collages and new paintings she had done since my last visit & explain that she was in the process a inventing a new technique involving texturized materials to be integrated in her canvasses. I could see that she was already thinking of a series of fifty or a hundred new works. The energy and creativity were truly awesome. A Grande Dame and a major artist has left us. Travel well, Mary — much, much love for you & Claude. Can you say more about the 2-Fisted Electric Banana book? I see the intro is by Burroughs, what was the technique used? Maybe a sample poem or two? Yeah — it is indeed Burroughs’ (or, better, Gysin & Burroughs’) cut-up technique Mary used in the Banana book. In those days she & Pélieu were core to a sort of Cut-Up Internationale that included Jeff Nuttal in England, Harold Norse wherever he was, & several Germans who took the cut-up extremely seriously: Carl Weissner (author of only one book but a superb one:_Braille Film_) and Jürgen Ploog (author, among many others, of _CocaCola Hinterland. A number of others — Jörg Fauser, Jan Herman (who now does a sort of art & media blog at: http://www.artsjournal.com/herman/)come to mind, as do the French poets of the “Electrique” group, especially Michel Bulteau & Matthieu Messagier. Mary beach was a player & often a publisher among that set. 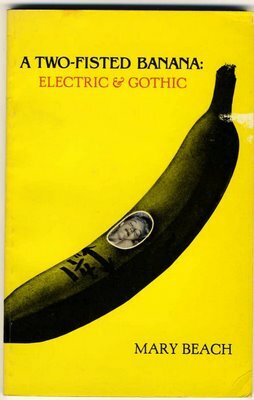 You can still buy copies of 20fisted electric banana from ABEBooks.com. I purchased a copy recently – it is three cut-up prose pieces by Beach and it is well worth reading.